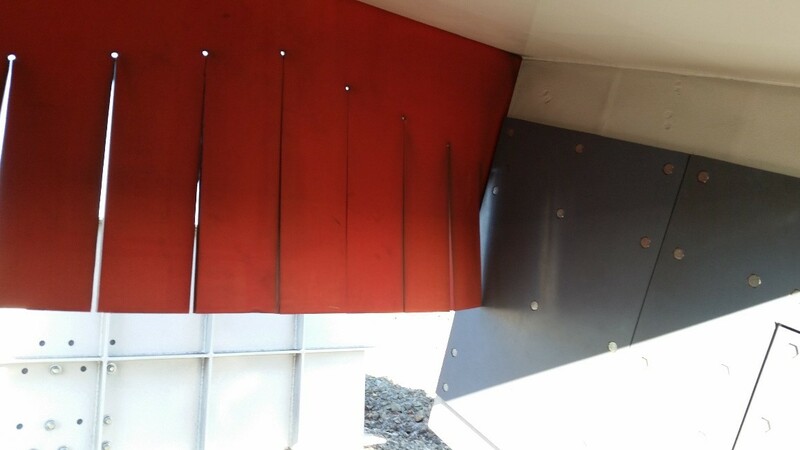 The purpose of dust curtains is to act as a sealing system at the load exit zone. Dust curtains are placed with one curtain at the exit point of the loading zone and one curtain approximately 500mm back into the loading zone. The curtains reduce the airflow velocity allowing any suspended solids particles to settle back onto the load. The inner curtain is a solid sheet whilst the exit curtain will have vertical strips approximately 50 mm apart and approximately 65% of the curtain height in length. These slits reduce the possibility that the curtain will push material from the product stream off the belt. The curtains hang down approximately 25 mm below the normal material profile on the belt. A wide range of rubber sheet systems have been used over the years, from very soft (e.g. Linatex) through to fabric reinforced (conveyor belt) and even curtains with rubber-ceramic composites bonded to the basic curtain. The basic curtain must also show adequate UV resistance to prevent premature failure. Rubber curtains fail by a wear mechanism involving cutting and gouging as the rubber strips continuously strike the loaded product. Generally compounds in the 50 to 60 Shore A range show optimum cut and gouge resistance. Tear strength, both initiation and propagation, is the important rubber property. Curtains should not be too stiff as they require the ability to be deflected by the product stream. The construction of the curtain sheeting will be dictated by the severity of the service conditions. The inclusion of fabric plies will increase the stiffness of the sheet; increase the tearing resistance and installation bolt holding ability. A light duty curtain would be plain rubber between 6 and 12 mm. A medium duty curtain would typically have a wear cover of 9 mm with 2 plies of PN150 fabric and a back cover of 2 mm for a total of 15 to 16 mm. A heavier curtain would be between 20 and 24 mm. The wear cover would be 15mm thick with 2 or 3 plies of PN150 fabric and a 2 mm back cover. To further increase the wear life either rubber-ceramic pads or additional rubber can be bonded to the wear face of the sheet. These additions only need to be positioned in the failure areas.